At QuakeWrap, Inc. we pride ourselves of being the world's most innovative FRP company. The original concept of repair and retrofit of structures with Fiber Reinforced Polymer (FRP) was first introduced to the construction industry in the late 1980s by Prof Ehsani and his associates. That system known as the wet layup has been successfully used worldwide over the last two decades. On the twentieth anniversary of that first paper, in March 2010, Prof. Ehsani introduced SuperLaminate™ to the construction industry. This technology allows large sheets of fabrics of glass or carbon to be saturated and pressed together under heat and pressure to create very thin (0.02 inch) FRP laminates. The laminates have tensile strength over 150,000 psi and are available in rolls that are 4-ft wide x 200-ft long. These laminates offer unique applications that heretofore been impossible with conventional wet lay-up systems. SuperLaminate™ products are marketed under the trade-names PileMedic™ and PipeMedic™. Our breakthrough technology in pipe and culvert repair was introduced in 2011 under the trade-name StifPipe™. All of tehse products and methods of repair of structures using these products are subject to pending U.S. and International Patents. These high-strength laminates are constructed with carbon, glass or any combination of fibers and offer tensile strengths as high as 4 times that of steel. The products have been tested and approved by the natural gas industry for repair of steel pipelines operating under high pressure. Please click here to find out more about this product and its application to the gas industry. A story published by the University of Arizona on the anniversary of the explosion caused by the natural gas pipeline in San Bruno, CA highlights the advantages of this invention which was recently approved by the Gas Technology Institute for repair of such pipes. This unique product is the only pipe that can be pre-manufactured to any size and shape! StifPipe™ offers tremendous strength and stiffness and is ideal for tunnels and culverts under roadways that are subjected to heavy overburden pressure from soil as well as traffic. Likewise, it can be used in repair of pressure pipes and tunnels when the design requirements call for a "free-standing" pipe that can take both internal pressure and external loads. Please click here to find out more about this product. This game-changing invention is an onsite manufactured pipe constructed of carbon FRP and honeycomb core. The small volume of raw materials needed can be delivered in a container to the job site where a mobile manufacturing unit can produce pipes of any diameter and pressure rating. The pipe can be produced endlessly in virtually any length, thus the name InfinitPipe™. The pipe is laid above ground or directly placed in a previously cut trench. The main advantage of InfinitPipe™ is that it eliminates the high cost of shipping large diameter pipes from the plant to the job site and it eliminates the joints in the pipeline that are the main source of leakage and maintenance cost. Additionally, because InfinitPipe™ is constructed of non-metallic carbon FRP, it will not corrode and it does not require any cathodic protection system. The news of this invention has gone viral on the internet; you can view some of these publications and discussions by clicking here. We are currently developing robots that can crawl inside a pipe and strengthen the pipe by application of carbon or glass fabric. The first generation of these robots is small enough to repair a 12-inch diameter pipe and will become available in spring 2012. Due to the proprietary nature of this product, we are unable to post photographs and videos of the robot on line. Those interested in this technology are invited to contact our office. publishes Prof. Ehsani's article on pipelines and energy infrastructure. QuakeWrap Completes Blast Hardening of UN Building in Beirut, Lebanon. The news of InfinitPipe™ goes viral over the internet! The fall 2011 issue covers story on Prof. Ehsani's innovations after his retirement. Read the January 2012 article on use of PileMedic to repair steel poles for Tucson Electric Power Company. 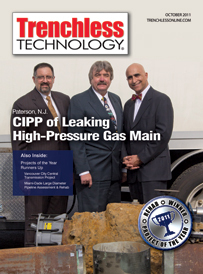 Sept. 15, 2011 story covers how PipeMedic can save lives by preventing failure & explosion in natural gas pipes. QuakeWrap Project is Magazine Cover Story! Copyright © 1994-2018 QuakeWrap Inc. All rights reserved. Web Hosting by Host Duplex.